Black hole: NGC 3862 sputtering jet. 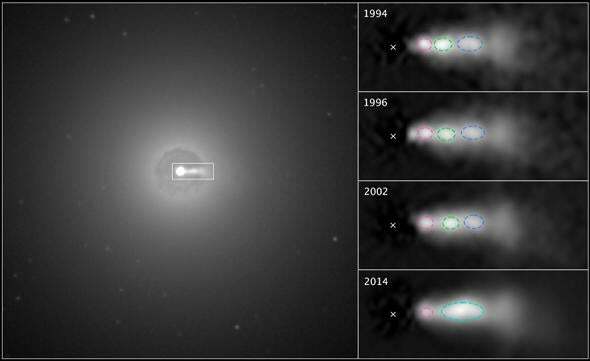 Two decades of a jet blasting from a black hole, c/o Hubble. Most people think of black holes as sort of the Universe’s own garbage disposal, but that’s hardly fair. In fact, they’re sloppy eaters: Matter falling in can form a huge swirling disk just above The Point Of No Return, and this disk can be incredibly hot. Think of gravity as an engine driving this material, and black holes have very strong gravity. These disks have an awesome amount of power at their disposal. This makes them very bright — among the brightest sustained sources of energy in the Universe! — and can also whip the material inside into a frenzy. The disks have complicated magnetic fields, too, and the extremely rapid rotation of material in the inner disk can form those fields into helical vortices, like magnetic tornadoes on a cosmic scale. This, as you might expect, can do quite a bit of violence to the surrounding area. Material from the disk is focused by these magnetic fields, forming twin beams, jets of matter and energy that blast outwards from the black hole. Again, the forces are awesome to comprehend: Much of this material is moving outward at just under the speed of light! Such is the situation in the galaxy NGC 3862, an elliptical fuzzball located about 260 million light years away. It has a supermassive black hole in its core, with at least many millions of times the mass of the Sun. It’s one of the very few galaxies that is blasting out a jet that can be seen in optical light (most are apparent in radio wavelengths), and the jet is clumpy. Apparently turbulence in the disk and jet cause it to sputter, ejecting blobs of matter outwards like a soap-bubble gun. These blobs move at different speeds, and sometimes a fast one can catch up to a slow one. This has been seen in smaller jets from other astronomical objects, but it’s never been seen before in another galaxy… until now. The image at the top of this post shows such a collision. The black hole in NGC 3862 is shown by the X, and three blobs are outlined. The galaxy was first observed by Hubble in 1992, when the jet was first discovered. It was re-targeted over many years since, and Hubble’s visual clarity plus stability over time has allowed astronomers to track the blobs in the jet. As you can see, over the years, the blob outlined in green has caught up with and merged into the one outlined in blue! It’s a rear-end collision on a galactic scale. Zoomed in view of the image above. What will happen now? It’s unclear; the physics of these jets and the blobs inside is fierce, to say the least. It’s known that such collisions can generate shock waves with vast amounts of energy, and this could accelerate the material and brighten it even more. It’s not known just how energy is dissipated inside of these jets, and further Hubble observations over the next few years may help us understand that. 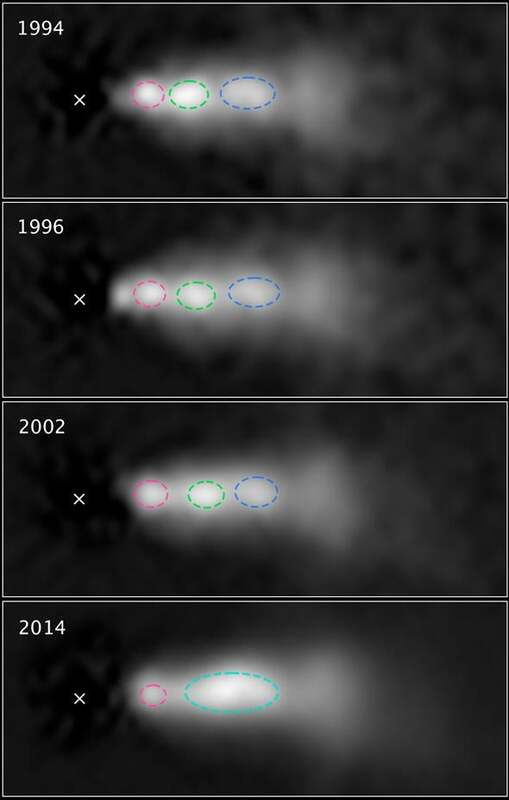 And I have to mention this bit: If you use the images taken over time (and knowing the jet is roughly 750 light years long) you can measure the speed of the blob that’s catching up to the other blob. The number you get may surprise you: It’s about seven times the speed of light. Hey, wait a sec. Nothing can travel faster than light! What gives? It’s a trick. Well, an illusion of perspective. This is called apparent superluminal motion, and it’s been seen many times. It comes about when an object is moving in a direction very close to but not quite directly toward you, and it’s moving very near the speed of light. The light it emits is only moving a little bit faster than the object itself, so this compresses the apparent amount of time it takes to move. If you’re curious, Wikipedia has the math written out, and the old Astronomy FAQ has a description, too (scroll down to H.08). But in the end, it’s a trick of perspective, and nothing is really moving faster than light. I expect some news articles reporting this might gloss over that, and people might misinterpret it, so I wanted to give you a heads-up. But even without warp drive, this is a pretty cool scientific result. We’re still pretty new at observing what happens close to black holes, and the math is pretty tricky. It’s not at all understood just how these jets form! Hopefully Hubble is just the beginning; newer, higher-resolution observatories are on the horizon, observing at different wavelengths of light as well, and our understanding will grow. The Universe is a pretty bizarre place, but we’re pretty good at reading its behavioral clues. Even when those clues are blasting out of the most terrifying locations in space.